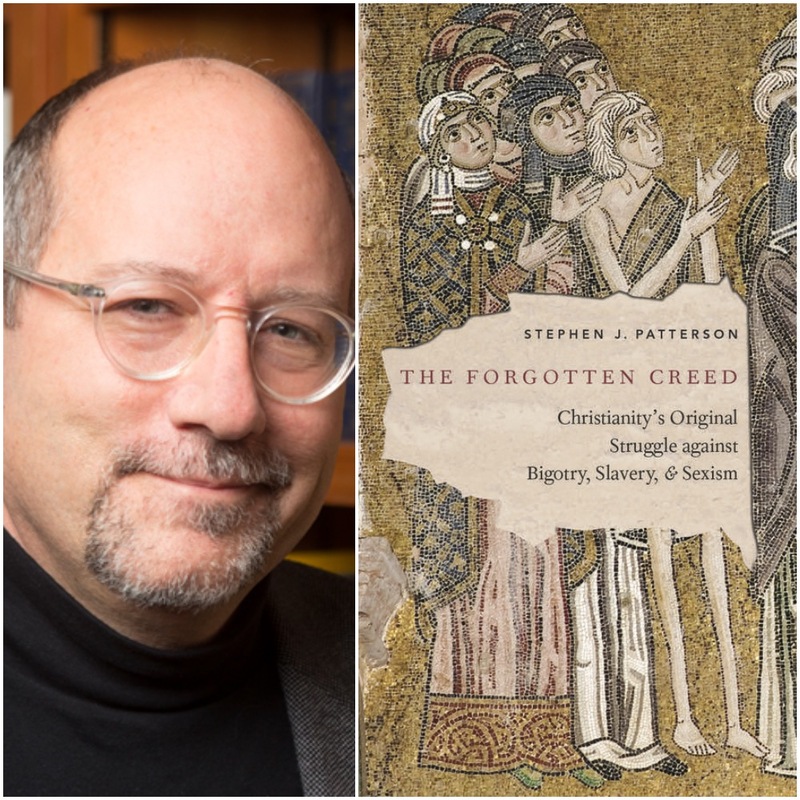 Historian of Religion, Stephen Patterson, reconstructs one of the earliest Christian Creeds that Emphasized Radical Egalitarianism. For you are all children of God in the Spirit. For you are all one in the Spirit. Dr. Patterson argues that this ancient creed is timely for today as it challenges ethnic, class, and gender divisions. Stephen J. Patterson is the George H. Atkinson Professor of Religious and Ethical Studies at Willamette University. A historian of religion, Patterson specializes in the origins of Christianity, especially the hidden histories founding books that were not included in the Bible. 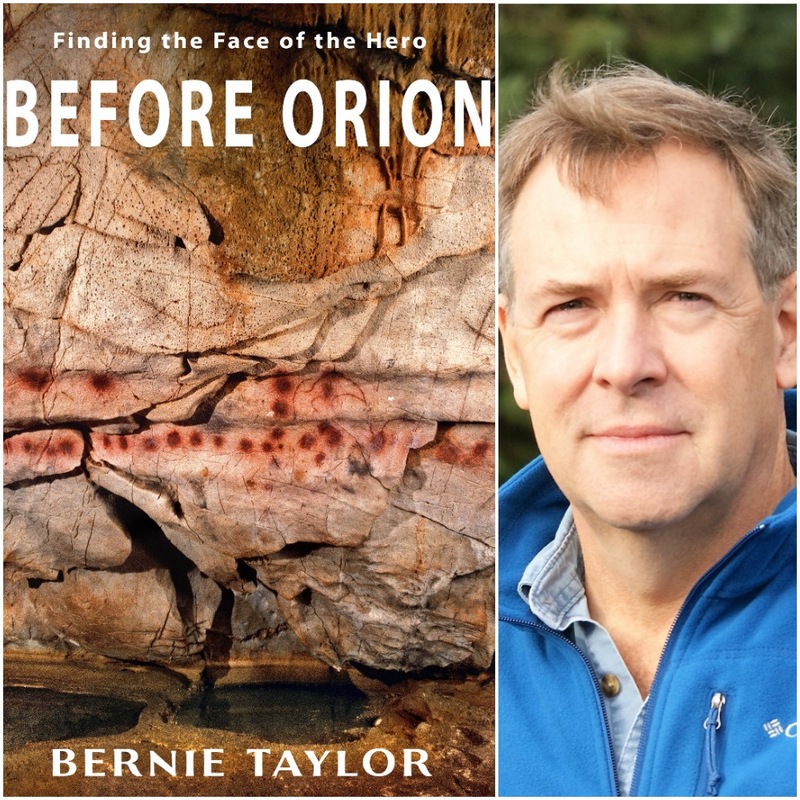 He has authored and co-authored nine books and more than a hundred essays, articles, and reviews, including most recently, The Gospel of Thomas and Christian Origins (2013) and The Lost Way: How Two Forgotten Gospels are Rewriting the Story of Christian Origins (2014). Why do the powers that be try to convince us that there is a “clash of cultures” or a conflict between Islam and the West or between Islam and Christianity? In this informative conversation we learn about the rise of European Colonialism and its handmaiden, Islamic Fundamentalism (now funded and supported by the U.S., the Saudis, and Israel) and the role of these modern powers in smearing Islam and framing Muslims as “terrorists” for geopolitical interests. Dr. Morrow invites us to wake up and learn our history. Find his writings on his website, John Andrew Morrow, and learn more about these historic covenants at Covenants of the Prophet. Dr. John Andrew Morrow was born in Montreal, Quebec, Canada, in 1971. Raised in a multilingual family, he lived in Montreal for ten years and in the Greater Toronto Area for another twenty. The product of a Catholic education, he completed his elementary school in French, his high school in English, and his university studies in English, French, and Spanish. He embraced Islam at the age of 16 after which he adopted the name Ilyas ‘Abd al-‘Alim Islam. After completing his Honors BA, MA, and PhD at the University of Toronto, where he acquired expertise in Hispanic, Native, and Islamic Studies, he pursued post-graduate studies in Arabic in Morocco and the United States. Besides his Western education, Dr. Morrow has completed the full cycle of traditional Islamic seminary studies both independently and at the hands of a series of Sunni, Shi’i, and Sufi scholars. Not only is he a senior scholar, academic, and professor, he is also a respected ‘alim holding the titles of ustadh, duktur, hakim, and shaykh. Dr. Morrow has spent over a decade and a half in the United States working at various universities including Park University, Northern State University, Eastern New Mexico University, the University of Virginia, and Ivy Tech where he was unanimously appointed to the rank of Full Professor. One of his most noteworthy and memorable experiences involved working as a professor of advanced Spanish, Islamic culture, and world literature for the Institute for Shipboard Education’s Semester at Sea Program. 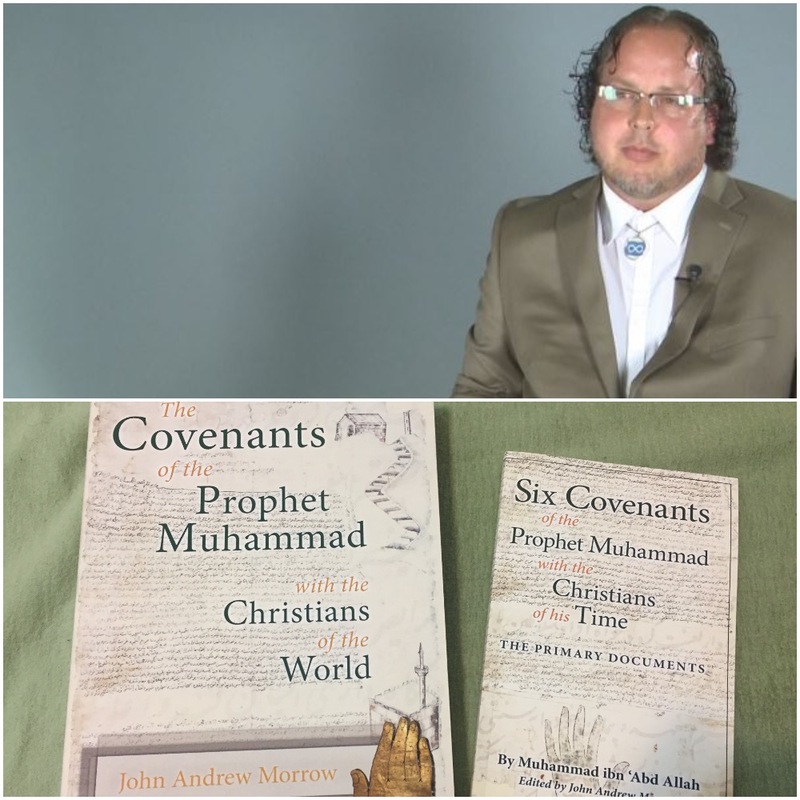 Aside from his academic duties, Dr. John Andrew Morrow is the Director of the Covenants Foundation, an organization dedicated to disseminating traditional, civilizational, Islam; promoting Islamic unity; protecting persecuted Christians; and improving relations between Muslims and members of other faiths. He regularly travels the world to promote peace and justice. Dr. John Andrew Morrow is a Native North American and a proud member of the Metis Nation. 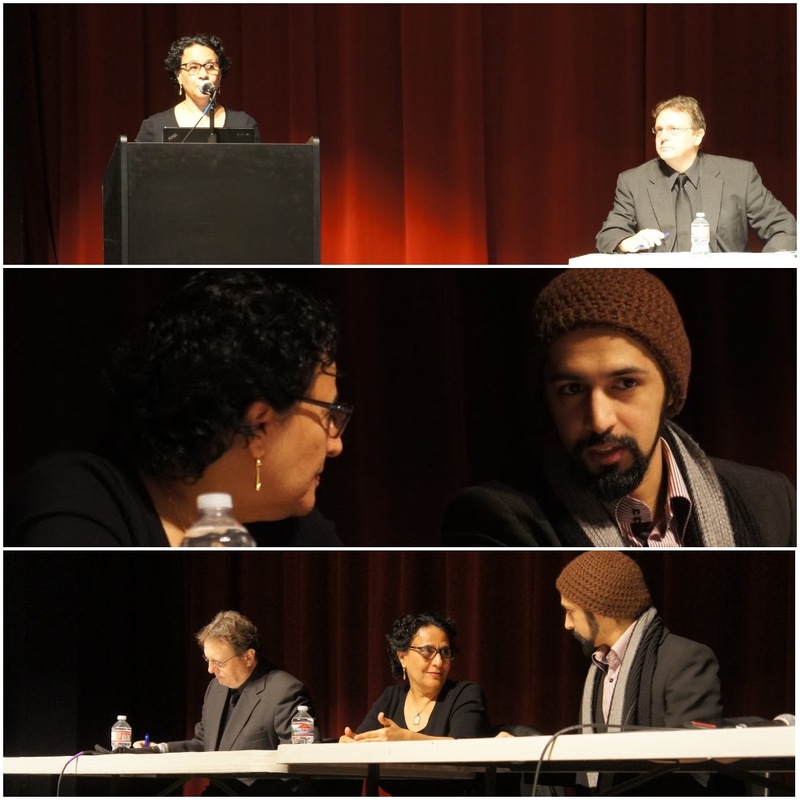 On February 3rd, 2018, Roots of Conflict and KBOO/Portland, co-sponsored a presentation at Portland State University called US-Saudi Coalition: Bringing Peace or War? In this episode you will hear from Yemeni activist, Aisha Jumaan and Mohammad al-Nimr, son of executed Sheik Nimr. They speak boldly and clearly about the Saudi war crimes against Yemen that are assisted by the United States and the United Kingdom. Dr. Aisha Jumaan is a public-health specialist working as a consultant on heath-related projects in Yemen. She offered a statistically detailed presentation of the human catastrophe going on in Yemen, as a result of the Saudi imposed war on that ancient country. More than fourteen million people require immediate humanitarian assistance and seven million are at risk of famine. Dr. Jumaan is the President of Yemen Relief and Reconstruction Foundation. Mohammad Al-Nimr, the son of Shia cleric, Shikh Nimr al-Nimr, who was executed by the Saudis for speaking out against Saudi human rights abuses, also spoke about the history of the formation of Saudi Arabia, its control by the royal family and Wahhabism and US complicity in the House of Sauds wars of aggression. Special thanks to David Rogers for recording the event and giving Progressive Spirit permission to edit it for radio broadcast. 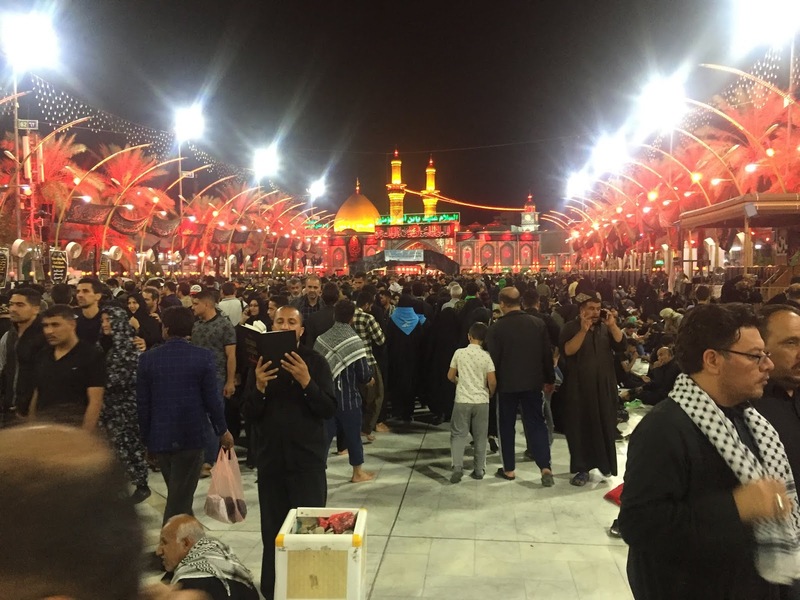 I am posting pics and thoughts on my Facebook page while I am participating in Arbaeen. 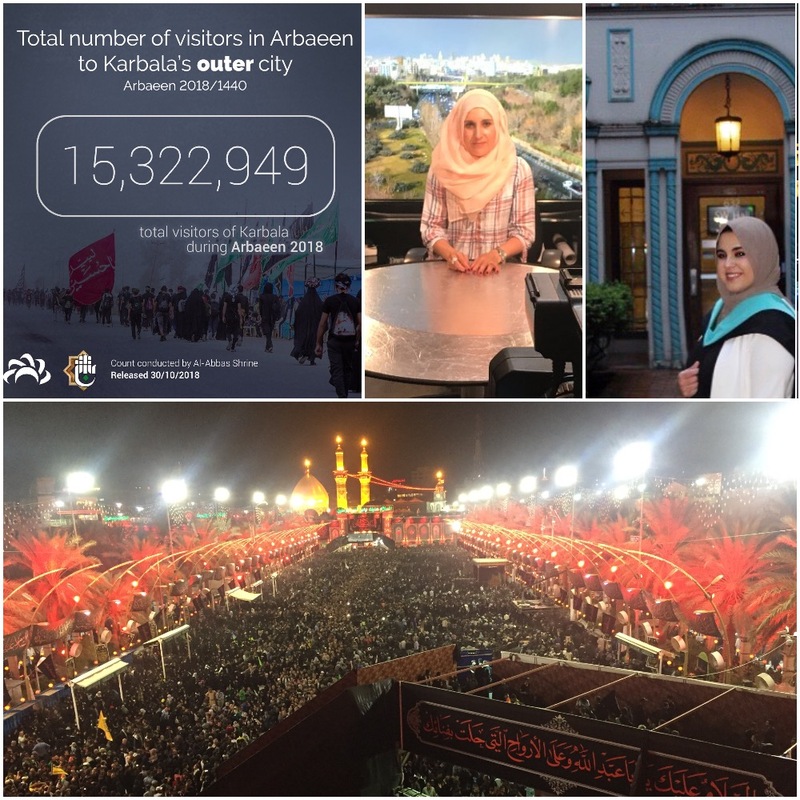 Here are some radio show podcasts on Husayn and Arbaeen that I have broadcast (or re-broadcast) this month while I am in Iraq. On April 13th, 2019, Josh Townsley and I will offer reflections and some audio/video on our trip, inshallah, for the Husaynia Society of Seattle. These are excerpts from speeches given at Husayn Day earlier this year in Seattle. This broadcast includes the speech from Maulana Mohammad Baig, who is leading the tour I am taking in Iraq. Caravan72.com. I just posted this interview with the author of the first book on Arbaeen in English. From my monthly live show on KBOO. Imam Muhsen Al-Dhalimy serves at the Islamic Center of Portland across from my church. Dr. Morrow also spoke at Husayn Day in Seattle. Here he talks about his very important work showing, despite propaganda to the contrary, that Christians and Muslims lived peacefully for centuries (and still do). This conference, sponsored by Roots of Conflict, features two powerful speakers, Aisha Jumaan and Mohammad Al-Nimr, who follow in the spirit of Imam Husayn (as). US – Saudi Coalition: Bringing Peace or War? On my live KBOO show, I spoke with Catherine Shakdam, Scott Bennett, and Aisha Jumaan about the conference. 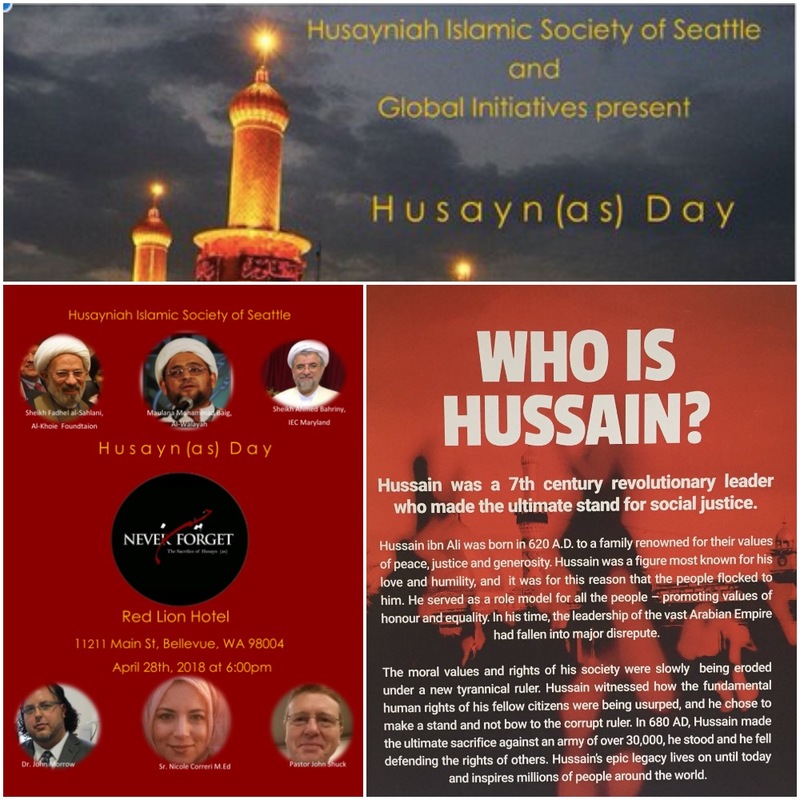 On April 28th 2018, The Husayniah Islamic Society of Seattle sponsored an interfaith educational event called Husayn Day. The event was a reflection upon Husayn, the martyred grandson of the Prophet Mohammad. Rather than bow to his oppressors, he, along with 72 family members were killed in Karbala, Iraq in 680 CE. He is considered a martyr for justice, truth, love, and resistance. He is a leading figure in Shia Islam and his death is mourned each year by between 15 and 20 million pilgrims who visit his shrine during the forty-day period of mourning from Ashura to Arbaeen. In the these two episodes, you will hear speeches from the presenters on Husayn and the yearly pilgrimage to his shrine. The presenters include, Dr. John Morrow, Sister Nicole Correri, Sheikh Fadhel Al-Salani, Sheik Ahmed Bahriny, Mohammad Baig, and me, John Shuck. The west is ignorant about Islam and, in particular, Shia Islam and the person of Hussain. Twenty million people visit his shrine each year. This the largest annual gathering of human beings on planet Earth. Yet, Western media ignores it. In this episode you will hear more about Husayn, and how he is for those who are devoted to him, a door to truth and justice, and how his sacrifice revealed the true Islam, the Islam of love. Sheikh Fadhel Al-Sahlani. Shiekh Al-Sahlani is the current leader of the Al-Khoei Foundation in New York. Sheik Ahmed Bahriny. Sheik Ahmed Bahriny is the resident imam and religious director of the Islamic Education Center in Potomoc, Maryland. Maulana Mohammad Baig. Maulana Baig leads the Alwalayah Community in Montclair, California. You will also hear a speech I gave at the event.